Anomalous Bristle-moss Orthotrichum anomalum or ‘Plant unknown’! I have a habit while out walking of photographing things which look interesting, even although I don’t know what many of them are. In fact my photo folder has quite a few images captioned ‘plant/insect/fungus unknown’. So, when I saw a moss growing on the parapet of the south most bridge over the Oldany River NC0932 on 16th December 2014 I thought that another ‘plant unknown’ was heading the same way! Undaunted I took several photos and was fairly happy with the result but something made we want to find out what this tiny little clump of green and brown and orange moss was. Thankfully there is a certain gentleman who lives in Nedd, Ian M Evans, who is a goldmine of information but also knows many others who have specialist resources which he can tap into. After checking with me if the moss was growing on the mortar or the stone of the bridge itself Ian spoke with Gordon Rothero who, along with Ian and Pat Evans co-wrote the indispensible ‘Flora of Assynt’; Ian and Pat did the flowering plants and ferns while Gordon dealt with his specialty the Bryophytes. 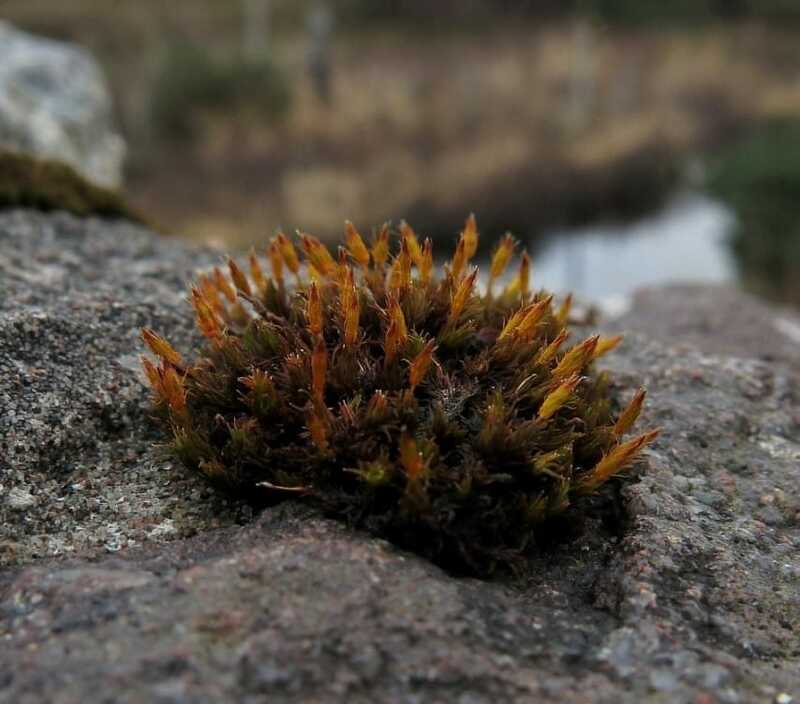 The end result was that Ian was able to say “I have talked to Gordon and the general appearance and microhabitat, coupled with a leaf character, makes it the Anomalous Bristle-moss Orthotrichum anomalum. Very common further south ‘on concrete, gravestones, wall tops and other man-made structures’, but only sparsely recorded from Assynt. So, a good record. Most other Orthotrichum spp. grow on trees and none of the others found on rock have the mature capsules held well above the cushions of leaves (the capsules on this specimen are still maturing). The hairy calyptrae (= hoods) are quite striking, though not unique to the genus”. So the potential ‘plant unknown’ was worth a photo or two and is now filed with a full caption and, thanks to digital photography, all the work to identify it was done within a couple of days of my having first recorded it using 13MB of information. Many thanks to Ian and Gordon.